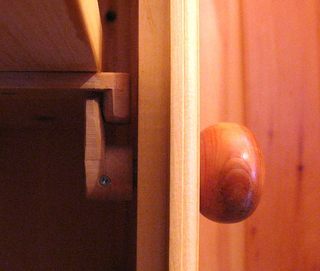 one of the things people love about the furniture my dad makes is the wooden hinges that he uses for many of his pieces. It wasn't so much a desire to create something new or novel that got my dad making his own hinges. Rather, it was a frustration with the types of hinges that were available. Living in Northern Ontario, the European style hinges that he was accustomed to were not readily available at a reasonable price. He didn't like the American style hinges, and the hidden pot hinges, in the early 80's were also not that wide spread there yet. They also didn't go very well with his style of furniture. So he started experimenting with making hinges out of wood. Eventually, he started making the hinges in larger batches, so that he wouldn't have to set up the machinery for it every time. 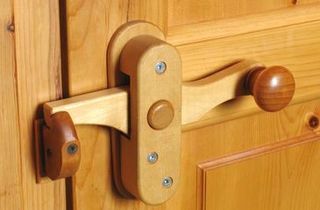 He also has various styles of hinges that he makes. 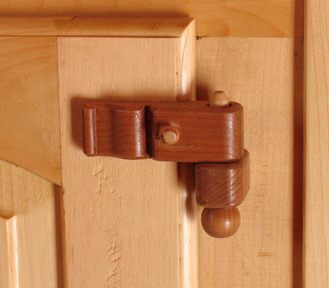 The hinges are all made from hardwood, mostly out of Maple and Oak. Unfortunately, I don't have any photos of hinges being made, because every time I visit, he's just using the hinges from his stock. 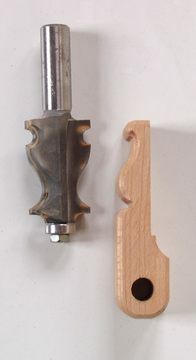 An important component of making lots of hinges is having a router bit to give them their ornate shape with. The other important part is having a drill just slightly larger than the hinge pin. 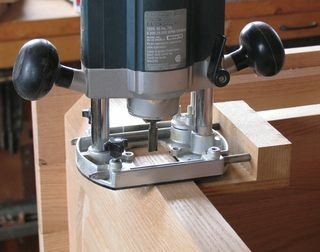 Using 3/8" dowels, my dad uses a 25/64'th inch drill to drill the hole in the top part, so that the hinge can turn loosely. A metric 10 mm drill for a 3/8" dowel should do the trick too. 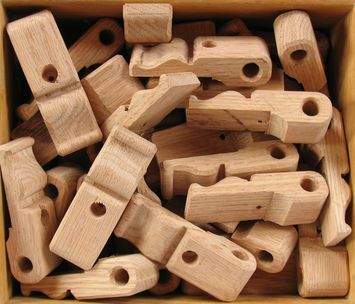 The knobs at the bottom of the hinges are each turned by hand on the lathe. 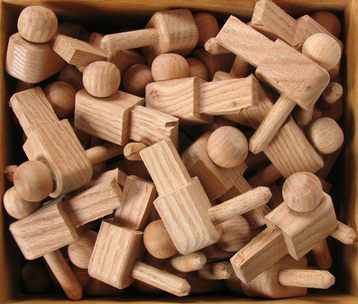 They are made to fit over the bottom end of the dowel. When my dad makes these knobs, he has a peg in the chuck of the lathe, on which he sticks the block to turn into a knob. 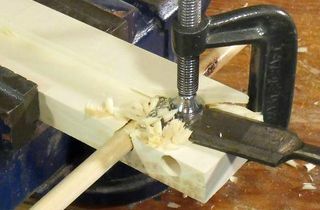 He actually puts the knob on the tightly fitting peg with some wood glue to get enough hold. When he's done turning the little knob, the glue hasn't fully set yet, so he can still pry it off the peg, and put the next one on the peg, again with glue. Because the bottom hinge pin part is rectangular, it requires a bit of a 'mortise' to install. My dad uses a plunge router to cut these into the cabinet after its mostly built. He had to build a special guide for this. It works like a regular router fence, but its much narrower. The regular router fence is too wide, which would not allow getting very far into the corners of the door openings of the piece of furniture. 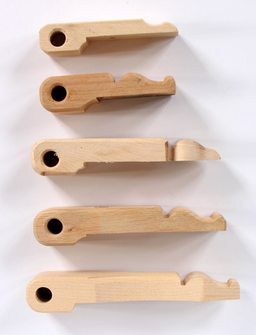 Of course, if you have wooden hinges, you might as well make some of the other 'hardware' out of wood. So the door catches are just knobs that if you turn hook in on the back. 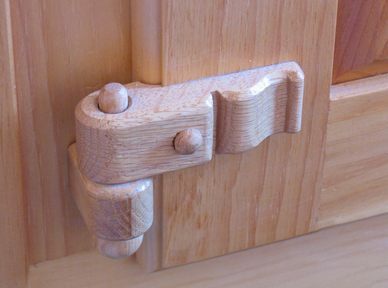 I hope these pictures inspire you, but I don't make these for sale, nor do I know of anyone who sells wooden hinges.